About Carl Blechen usually speak of a romantic landscape painter and one of the founders of a realistic landscape. He studied since 1822 at the Berlin Academy, traveled to Italy, France. The artist worked extensively in the open air. The romantic landscapes of Blechen aroused public interest, like his later “prosaic” works, with urban and factory views. 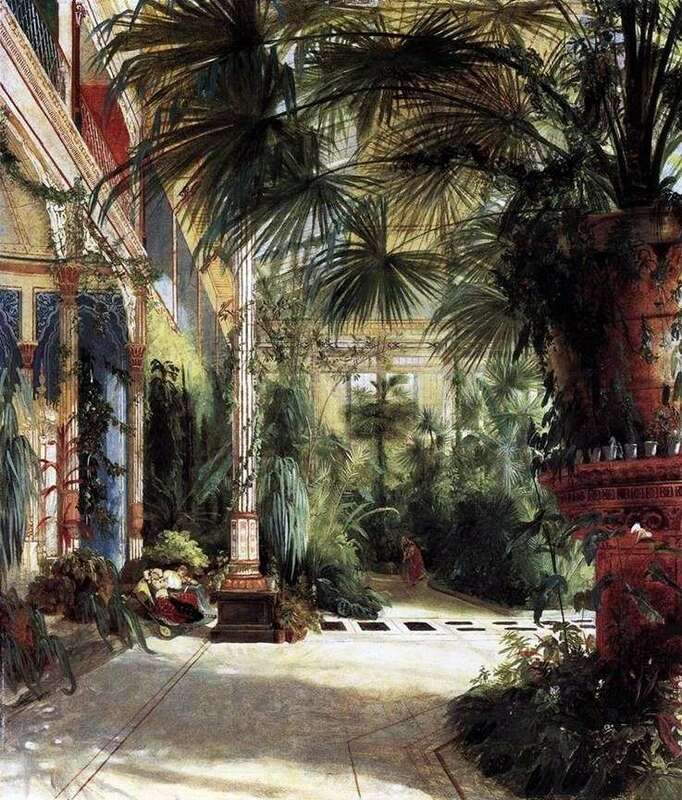 The painting “The Palm Court of Frederick William III” is executed in a very realistic manner. It is felt how closely the artist watches the distribution of light and color, but the choice of the plot, its unusual, exotic character, testify to Blechen’s romantic predilections. Other famous works: “Park Villa d’Este”. OK. 1830. State museums, Berlin; “Iron-rolling plant near Neustadt-Eberswalde.” 1834. State museums, Berlin; “View of the gardens and roofs.” State museums, Berlin. Description and meaning of the painting The Palm Court of Friedrich Wilhelm by Carl Eduard Ferdinand Blechen.